I had a lot of great posts on my to-do list last week…and then ACOWAR was released and I did nothing but read all week (well, aside from the usual day job and such). 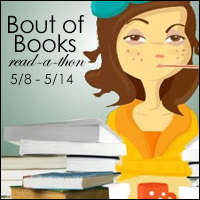 BUT–I’m so glad Kristilyn at Reading in Winter posted her Bout of Books Read-a-thon post and reminded me that Bout of Books starts tomorrow. Thanks Kristilyn! I discovered Bout of Books last year and thought it was so fun and so neat. I’ve since added all the upcoming dates to my calendar because I don’t want to miss out again. What is Bout of Books, you ask? Read-a-thons are a great way to tackle that ever-growing TBR. And the best part of Bout of Books, is that it’s not stressful. There are no rules about how much you need to read. It’s simply about the joy of reading and connecting with other readers. All the challenges are optional, and usually not super difficult. I have a bunch of books from the library right now and my goal is to read those this week so I can get them back to the library for the other folks waiting on them. If I finish these books, I’ll start tackling some of the books I’ve recently received for review. Are you participating in the read-a-thon? What are you planning on reading?